Round Top in Spring, Outside of Meiss Roadless Area South of the Tahoe Basin. The PCT and TYT routes part company around Round Top. Backpacking Meiss Country Roadless Area on the Tahoe to Yosemite Trail. A break with Pete, Jason, Pat and Jan. Round Top in the distance peeking over the South end of the Tahoe Rim from outside the Tahoe Basin. We're peering South from the natural break-spot in the gap half-way up from the bridge to the high point crossing Peak 8905. Above is our furthest view South. Our two potential trails South split going around Round Top and the Sisters. The Tahoe to Yosemite Trail crosses Round Top to the Southwest, the Right side of image, while the Pacific Crest Trail winds around the East flank of the Round Top and the Sisters massif, not too far out of the Left edge of the image. Round Top and the Sisters marks the real divergence point of the TYT and PCT. The map and miles information below covers hiking us to the bottom of the Tahoe Basin, where we face our Southbound route options, which begin with how we pass South of Round Top. This map below shows our route options across and around Round Top and The Sisters in the Carson Pass Management Area after we exit the South end of the Tahoe Basin. Passing South of the Frog Pond Loop and crossing the foot bridge marks the beginning of a hard but short climb up a steep gorge. You may not know it yet, but we are climbing towards a gap in the mountains about halfway between the top and the bottom, located 1.2 miles South of the Frog Pond junction, that gives us long views East and South, as seen above and below. I think I've noticed an anomaly between the USGS 7.5 map and the actual trail route here, 2.11 miles South of Echo Summit, at the top of the climb South from the bridge where we are getting close to our upcoming break spot. This reroute is not a problem for hikers to follow. It's just different from the trail route on the map. It appears the trail has been rerouted to switch back up to and then around the Northeast flank of the knoll that makes up the peak rising on the North side of the gap where our upcoming break spot/flat is located. The topo map shows the trail following the creek up the Northwest side of the ridge-arm to the gap. The reroute moves the trail around the Northeast flank of the top of the ridge-arm. This is a more logical route to avoid damage during the thaw. The new route changes the approach to our break spot at the gap to coming from the North-Northeast rather than from the North-Northwest. I marked the difference on the map above. However we approach it, this gap in the terrain serves as a great spot to take a long peek at the views, kick back for a break, and it's also a natural backpacker meeting spot located between the climb to get to it, and the climb to get out of it. South of this nifty gap we have another 600 feet of climbing up the next short .74 mile length of trail bringing us to our 8760 feet of elevation high spot across Peak 8905 along the 4.65 miles remaining of our hike South from this wonderful gap to Showers Lake. This reroute up to the gap would have been done to get the trail out of the active terrain along the creek drainage, as shown on the USGS topo map, onto more stable footing to better secure the trail bed. This route has changed much over the decades. I'll check this section closely with map in hand next time I hike through. Your input on this segment of trail would be cool. A little over two miles South of the Echo Summit Trailhead we climb up around to an exposed high point indicating we've reached the top of the lower climb. We have reached the top of the Eastern wing of ridge arm making up the Eastern flank of the lower gorge, and as we climb to the top of this extension of the ridge arm we see it's sporting a nice, fairly sheltered flat in a gap along the top of the ridge arm. 2.14 miles South from Echo Summit. 4.66 South to the first Showers Lake trail marker (+.4 more to the lake itself). 9.86 miles South to the Carson Pass. We've been climbing with few views overlooking Christmas Valley and the terrain and topography to our East. This gap gives us great view and its comfortable break-spot provides us with a very timely place to study it for a while. I have been needing both a break and a good, sustained long view since hiking South from Echo Summit Trailhead! Approaching the flat in the gap we can see Round Top to the South, located outside the Tahoe Basin, peeking over the line of mountains making up the Tahoe Rim. To our East we have views across, up, and down the length of Christmas Valley. The line of the Tahoe Rim we see Round Top peeking over the top of in the picture above, is part of the furthest extent of the headwaters bowl of Christmas Valley. We get some fine views from up here on our little perch on the edge of the Tahoe Basin! celebrate the view with a rich, tasty beverage. After getting our bearings and our beverage at the overlook we depart the flat to finish the the climb through the upper segment of the upper end of the gorge. We continue a difficult climb through the top of this steep gorge out into moderately-heavily forested terrain across the East shoulder of Peak 8905. The high point of our trail passes a couple of hundred feet East of and below Peak 8905, where we begin a quiet descent. I say quiet because hiking off the South flank of Peak 8905 we see the terrain and forest are beginning to thin out and open up a bit. Well, opening a lot compared to our situation climbing up the gorge. The forest thins and the terrain opens up more as we bend West with the trail over to the Bryan Meadow junction at the top of Bryan Meadow. Though the terrain has opened up significantly, in that we have come out of the almost claustrophobic confines of the great granite gorge, our views are still very much shrouded and restricted under thick forest cover, clipped by the still-significant granite outcroppings dotting the slopes, and now by the fact that our Southbound trail has bent West onto the Western Flank of the Sierra towards Bryan Meadow. Now that we've gotten up to the top of the Tahoe Rim the trail is turning us away from the edge of Christmas Valley and any potential grand views into the complexity of the terrain in the top of Christmas Valley, or the expansive views down Christmas Valley and across the splendors of Lake Tahoe and Southeast Tahoe Basin beyond. I always have to remind myself that hiking these "close-in" segments of trail prove there are many more beauties than just long views. Well, this segment of trail from Echo Summit to Showers Lake offers different and more varied experiences than just long views precisely because it is lacking long views. In this case, "less is more." Our truncated horizon focuses all of our attentions within a much smaller circle, and that concentration brings greater focus and clarity, if not a subliminal intensity, to our reduced sphere of perception. Our next segment of trail South from its high point crossing Peak 8905 are 3.91 miles mostly down, hiking straight through three trail junctions along the bending line of Sierra Crest to Showers Lake. All three of these junctions sprout trails breaking off the line of the Tahoe Rim leading West or South out of the Tahoe Basin. The first two junctions as we encounter them hiking South are the Bryan Meadow and Sayles Canyon trail junctions separated by .85 of a mile. The routes of these trails join further down the Western Flank to end together at Camp Sacramento on Highway 50. The outline of these two trails Southwest to Highway 50 from their the junctions along the TYT form a trail "Y" connecting a single trail down to Camp Sacramento on Highway 50 with these two successive junctions along the TYT-PCT. The Northern Bryan Meadow junction is located at the top of Bryan Meadow, which the trail crosses before descending with the creek flowing out the meadow to join up with the creek flowing down Sayles Canyon, where Bryan Meadow Trail intersects with the Sayles Canyon Trail. The Bryan Meadow and Sayles Trails intersect where the branches of the creeks draining each of their routes converge. This is where the tines of the trail's "Y" join for their remaining distance down to Camp Sacramento. Aggressive day hikers and short distance backpackers can begin or end short backpacking trips into the Meiss Country Roadless Area through the Sayles Canyon Trailhead above Camp Sacramento. Continuing South through the Sayles Canyon trail junction our meandering trail along this quiet, lodge pole forested segment of the Sierra Crestline begins climbing as we approach Little Round Top. Little Round Top's 9590 feet of elevation makes it the dominant peak along this section of Tahoe Rim South to down to Red Lake Peak towering above the Carson Gap, and North to Pyramid Peak in Desolation Wilderness. We climb the gentle rise of an I-3 segment of trail a total of 1.27 miles South of the Sayles trail junction to the Schneiders Camp trail junction. The Schneider Camp trail junction sits at the Northwestern base of the ridge arm extending Northwest off Little Round Top. Southbound hikers on the TYT-PCT-TRT continue Straight through this junction, keeping a Southeastern line by the compass. The trail to Schnieders Camp tees-off the main line of the TYT-PCT to the Southwest, the Southbound backpacker's Right. Following the trail West we would find the trail to Schneiders Camp moving alternately West and South as its route stair-steps its way around the North and Western Flanks of Little Round Top, escaping around the mountaintop out the Tahoe Basin to find its way down the South Flank of Little Round Top to Schneider Camp. Schneider Camp is serviced by a dirt road coming North from Caples Lake on Highway 88. Caples Lake is a few miles West of Carson Pass on Highway 88. From the Schneiders Camp trail junction our Southbound TYT-PCT-TRT routes track Southeast under the sheer Northeastern Flank of Little Round Top. The trail tracks along the base of the mountain's Northern footprint making our final approach to Showers Lake. The terrain opens nicely now, opening up to reveal a topographical feature I define as a thin "shelf" of flattened terrain wedged-in and wrapping around under the remaining extent of Southern Rim of the Tahoe Basin. To our Right, our Southwest, rises the low line of the Tahoe Rim itself, the Sierra Crest wrapping around the South end of the Tahoe Basin. In front of us, to our Southeast, we can make out the line a flat shelf of terrain running just under the crestline. To our Left, our Northeast, we see the descending watershed of the South Upper Truckee draining into Lake Tahoe beyond. Backdropping this whole scene is the Carson Range running North from beyond Meiss Meadow. This narrow shelf wrapping around the Southwest end of the Tahoe Basin begins with Showers Lake, and extends Southeast all the way down to the East end of Meiss Meadow. Our route South follows this narrow, undulating flat to Meiss Meadow, where we turn to exit the Tahoe Basin through the Carson Gap. Just a bit South of the Schneiders Camp junction we finally begin emerging out from under dense forest cover, and a few steps later pass out from behind the last bits of granite terrain outcroppings that have been blocking our views of the expansive, seemingly unlimited grand views of the Tahoe Basin from those closer at hand. I am chomping at the bit by now for unrestricted views in all possible directions! We are nestled in under the Southernmost part of the Tahoe Rim, so the views possible to our South are terribly short, but at this point our views North and East really open up. We finally get the grand view North down the length of Christmas Valley. Our view extends beyond the valley and out across the South end of Lake Tahoe, finally settling on the massive but stark Northern elements of the Carson Range wrapping around Tahoe's East Shore. This is the view laid out for our inspection as we hike around the North Flank of Little Round Top. We have been looking East across Christmas Valley at the East Flank of the Southern Carson Range every chance we've gotten while hiking South from Echo Summit. Now, we are finally getting some expansive views North and East of the extent of the Carson Range from a real nice perspective as we are making our final approach to the very Southern End of the Tahoe Rim. We are drawing closer and closer to the Carson Range as we draw closer to our exit point out of the Tahoe Basin through the Carson Gap. We will kick a few steps on the Carson Range at its very Southern terminus point, which I define as Red Lake Peak. These two trails linking Highway 50 to the West and the third linking Highway 88 to our South with our unified TYT-PCT-TRT route across Meiss Country are depicted on the two maps below. These trails offer short routes we can put together into fine little backpacking trips into the Meiss Country Roadless Area starting from and finishing exclusively on Highway 50 or Highway 88 trailheads. 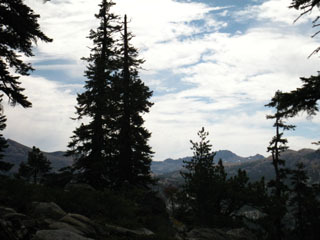 The relationship between the Echo Summit and Carson Pass Trailheads to these trails makes short trips of intermediate difficulty across different short segments of Meiss Country possible. We can use these trails to execute long day hikes and short backpacking trips between trailheads along Highway 50 or between trailheads on Highway 88, respectively. These short trips are ideal for backpackers developing High Sierra backpacking experience, and day hikers who already have lots of experience and stamina. The easiest directions to hike would always be "top to bottom." That means starting our trips through the higher elevation trailheads of Echo Summit or Carson Pass, then hiking to the Schneider, Sayles, or Bryan Meadow junction (whichever is most suitable for our particular trip), to descend to our selected ending trailhead. Schneider Camp off Highway 88. Round Top and the Eastern Sister in the distance. The trail ahead winds between mountain tops surrounded by dense forests through a roller coaster of rises and falls. But you will make no mistake about the nature of this hike being upward, compounded by short descents. We move out of the drainage feeding Benwood Meadow below as we climb towards the Eastern-facing gap in the Western flank of Christmas Valley that will give us long views. As we approach our break spot, about 2.14 miles South of Echo Summit, fine views of Round Top, about 11 miles South, open up through the trees. Round Top (guide) sits just Southwest of Carson Pass, outside of the Lake Tahoe Basin. 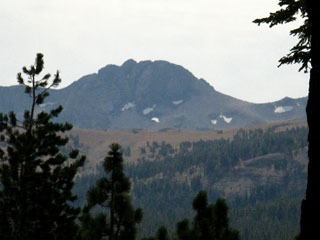 One of the two Sisters, the pointy peak to the right of Round Top, is also visible. 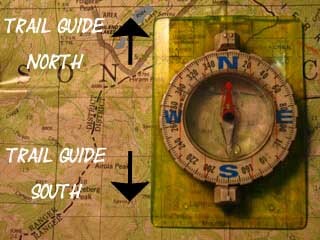 When we exit the Tahoe Basin at the Carson Gap, (guide) we must choose which trail we follow South, the PCT or the TYT. The PCT runs to the left, Southeast of Round Top's massif while the Tahoe-Yosemite trail passes to its right, to its Southwest. Click the Red Dots on the MAP for the Related Trail Page. The maps act as an index for that area's trail guide pages. For just a small section along the trail Round Top comes fully into view. Highway 88 runs East and West at the base of the far flank of the foreground ridge, which is the South Rim of the Tahoe Basin, with Round Top sitting beyond Highway 88. The Tahoe to Yosemite Trail (map) passes under the Crest of Round Top, just out of sight, obscured by the Tahoe Rim in the image above. Looking East across Christmas Valley. Here the valley splits whole mountain ranges. 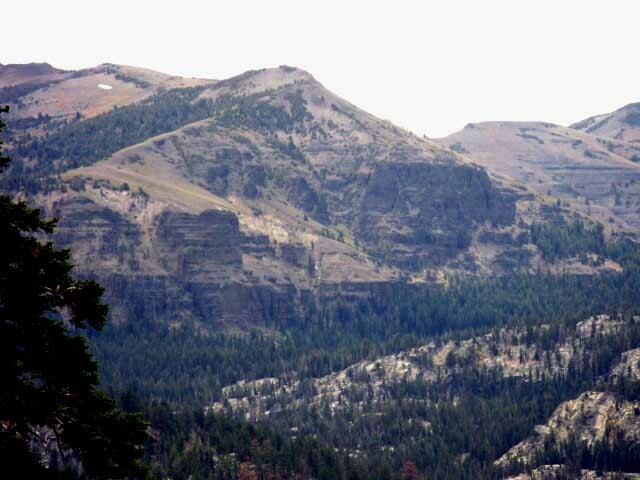 The Eastern Wall of Christmas Valley is the West Flank of the Carson Range, while the West Flank of the Valley is the East Flank of the Sierra Crest. The South Upper Truckee Trail (guide) from Meyers tracks South (Right) towards the Pacific Crest Trail junction through Christmas Valley below this formation. 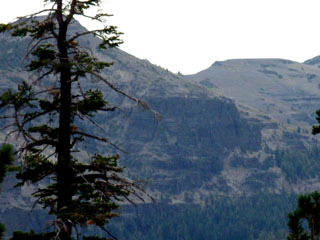 This rock formation sits above, and just a bit South of Round Lake (guide). massif 1. a geologically distinct mass of rock or a series of connected masses forming the peaks of a mountain range. Looking to the Southeast at where the South Upper Truckee River drains Christmas Valley between the Carson and Sierra Nevada Ranges. Round Lake and Dardanelles Lake sit within Christmas Valley. Round Lake sits in the forest below the volcanic formation Left of center. Notice that the terrain is volcanic on the Carson Range's Eastern flank of Christmas Valley, while the Sierra's Western flank is granite. Cool. This same type of bold yet impossibly intricate interface also splits Brown Bear Pass, down South in the Emigrant Wilderness. And, this granite-volcanic interface runs all the way down the Sierra Crestline, sometimes spilling over to the West, though most times running along the crest and covering the Eastern flank. It's like the volcanic material coats the East flank of the Sierra and runs over and down the Western flank in a random "overflow" patterns. Eruptions appear to have been centered on the crest and Eastern flank. As we hike South along the rim of the Tahoe Basin on this combined Pacific Crest, Tahoe Rim, & Tahoe to Yosemite Trails route, we will exit this granite zone passing Showers Lake and be hiking across volcanic terrain until we are well past Ebbetts Pass, except for small islands of granite, in this vast sea of high altitude volcanic debris. Well, at least on the Pacific Crest Trail. On the Tahoe to Yosemite Trail we'll cross out of the volcanic hiking over Round Top and the Sisters, dropping into the great granite Summit City Canyon at the base of Round Top and The Sister's South flank. All's I have to say about that is, "Woooo-Hoooo." Check out the view of our position up here from down there. Also review these perspectives of Round Lake and Dardanelles Lake. The Meyers trailhead is to the left out of the frame above, located a bit further downstream where the South Upper Truckee River flattens out entering the meadows decorating lower Christmas Valley. Check the relationship of all these features on the maps. Hiking South on the TYT-PCT-TRT from our point here we will intersect with the Round Lake/Meyers trail runs up through Christmas Valley about 7 miles further South along the Tahoe Rim near Meiss Cabin in Meiss Meadow. Detail of volcanic rock to the East above Round Lake in Christmas Valley making up the crumbling volcanic spire East flank of Christmas Valley. 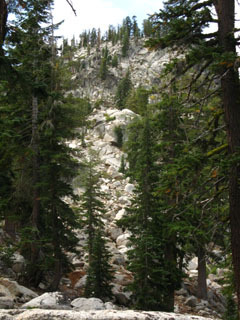 Hiking up to this overlook on this part of the Tahoe to Yosemite Trail is a still climb shrouded under dense forest packed into a granite fold between the mountain ridges until the trail passes through a gap in the close forest and rock terrain to a clear overlook with views East and South. The new trail route now goes around the mountain top to the North of the marked "overlook" position on the USGS 15 minute map. This vista is complimented with an expansive flat littered with boulders and rocks providing excellent seating. Well, this flat is expansive compared to the "close-in" dense forest and rock terrain we hiked up through to get here. It's a quick, stiff 400 foot climb over a short distance, independent of the rerouted location of the trail. Excellent seating and expansive views make this flat location a natural break and meeting spot for hikers between Echo Summit and Showers Lake. Pete and Jason. Cool Dudes. Had a nice break with these guys. I had plenty of food, and therefore plenty of time to get to Showers Lake. They had the remainder of their trail pouch, and were on their way out. We had a smoke and they left their pouch with me. 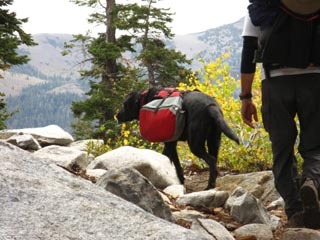 Pete and Jason's Trail Dog Cole packed for action, heading back to Echo Summit from an overnight at Showers Lake. 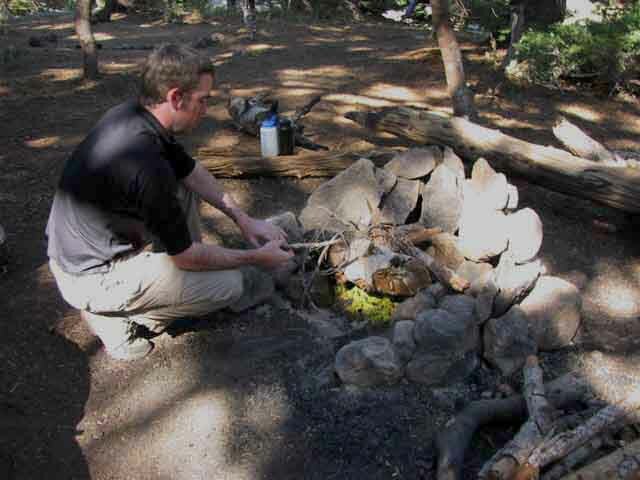 "I included this one as a trail tip - the green moss/lichen we can see at the base of the fire above is making a GREAT starter material." By Peter of Jason prepping the Fire. Find the fallen snags that have fallen and dried out to crack up into little dry cubes of wood. With moss, these are the easiest fire starter materials. Got Good Trail Information?Good Intentions? Good Observation, Analysis, and Response Skills?Insight?Want Them? Ask Yourself if You Are Tahoe to Whitney Member Material. GET YOURSELF OUT DAY HIKING! Lingering after Peter and Jason departed allowed us to meet Jan and Pat. Jan and Pat were out on an ambitious day hike. I believe they went out to the Sayles Junction from Echo Summit and back. 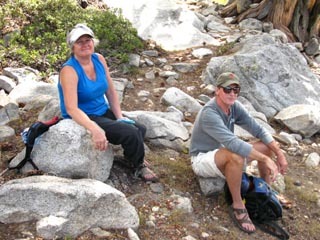 Pat is an astute observer of man and nature, and I enjoyed a lively chat with Pat and Jan. Jan and Pat demonstrate the value of this section of Tahoe to Yosemite Trail for day hiking. You meet lots of good folks on the High Sierra trails. Jan and Pat taking a break during what appeared to be an 8 to 10 mile aggressive day hike. 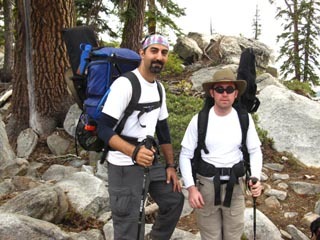 I believe they were training and hiking themselves into condition to start backpacking sections of the Tahoe Rim Trail. There are a lot of cool day hikers in the Meiss Country Roadless Area. We had an excellent conversation. If you want to restore your faith in humanity, spend a few weeks on the Sierra trails meeting great people from California, the United States, and around the world. A little over 2.14 miles South of the Echo Summit trail head, according to the map, (though it appears to me that the trail was re-routed through part of this section, is a bit different, and a bit longer than as depicted on the USGS 15 min map. The trail now passes around the North flank of the North peak hiking South approaching the gap, before bending around the North peak to pass through this nifty gap between these two peaks. Here we have a short space offering a nice flat, seating for lunch and breaks, with a few good views of much of the Meiss Roadless Area to the East and South. This is what I consider the top of the first half, the bottom half of the big climb South of Echo Summit. Having a good view, and there being a nice place to sit and take a break while enjoying this view are only the #2 and #3 reasons to stop here for a break. Reason #1 by, by far, are the cool hikers I meet here. This is a natural stopping place for hikers on this trail. The last time hiking through the first backpackers in after I arrived were Pete and Jason, two cool dudes out of the El Dorado Hills. They joined us for a break on their way South to their car at Echo Summit after camping at Showers Lake. They had a pouch of Bugler, which was gold to me at that point. I generally stop smoking on the trail, but when they saw my face when I saw their tobacco pouch, they quickly consulted, determined their needs over the length of their remaining hike to the trailhead and back home, and presented me the rest of their trail tobacco pouch. I really enjoyed my after-hiking hot chocolate and smoke that evening! I tarried a bit after they departed, and shortly Pat and Jan came around the corner, also hiking back towards Echo Summit. They were also ready for a break, so I kicked it longer and enjoyed their company. Being able to stop and enjoy the company of other backpackers and hikers is an important reason to pack the proper amount of food. If we are always running short of food, we will have little time to explore the personality of each region as well as the personalities of the interesting people out there enjoying it with us as we hike through. Pat had a real nice insulation/shell layer that combined the attributes of both an insulation layer and a shell. He really liked it a lot, so I thought I's mention it. It is a new piece of technical clothing from "arctech" It was a fine, light, insulating shell layer. Though it did not have a hood, it's breathable insulating qualities made it a fine candidate to replace my fleece coat layer, if I ever get rich. It was quite costly. But the finest, lightest, most effective gear always is. That's one reason why I'm packing heavy more often than light. Check out the gear section. So far, today was more of a social day than a hiking day. I spent a couple of hours hanging out with Randy early in the day. I kicked it for awhile with The Mighty Mike doing the TRT. I enjoyed a smoke and talk with Pete and Jason, and then had a fine conversation with Pat and Jan overlooking a wide swath of the Meiss Country. It would be a 7.8 mile day. Quite a social day on the trail. No worries. We've got plenty of high mileage days ahead on the way South to Tuolumne Meadows, and on to Mount Whitney. And, I'm not going to miss meeting the fine people along the way populating the long trails between Tahoe and Whitney, as long as the food holds out. General Sierra Nevada hiking thoughts to relate? On the Forums you can browse locations along the trail and add your experiences, comments, questions (or pictures and videos) about hiking South out of the Echo Summit Trail Head.